Our commitment to strengthen the communities where our customers live and work is at the heart of our business. We are investing in partnerships that enrich educational opportunities, preserve our environment, promote emergency preparedness and support economic vitality. Our community investments demonstrate that we are more than just a utility; we are a community partner helping to build a better California. Each year, PG&E provides numerous grants to organizations across Northern and Central California. These grants support 501(c)(3) nonprofit organizations, schools and local governments. Our community investment strategy focuses on education, the environment, economic and community vitality, and—new in 2015—emergency preparedness. In support of these focus areas, each year we provide several high-impact grants, along with about 1,300 local grants, to support community needs. We prioritize supporting underserved communities and partnerships that provide volunteer opportunities for our employees. We also make in-kind contributions and provide other forms of support to community groups. As always, PG&E’s community investment program is funded entirely by shareholders and has no impact on our customers’ electric or natural gas rates. Our Community Service Award program allows employees who log more than 25 volunteer hours with one organization to direct $350 to that organization. Each of PG&E’s 10 Employee Resource Groups—representing PG&E’s diverse workforce—is given the opportunity to direct funds to community groups and activities. Our Matching Gifts Program enables PG&E to match eligible gifts dollar-for-dollar up to $1,000 per calendar year per employee, retiree or current member of the PG&E Corporation Board of Directors. For the third year in a row, Pacific Gas and Electric Company earned a spot on the Civic 50 as one of America’s most community-minded companies. The list highlighted the S&P 500 corporations that best use their time, talent and resources to improve the quality of life in the communities where they do business. PG&E’s community investment program is powering local organizations and fostering healthy, vibrant communities where our customers live and work. Here are highlights from each of our focus areas in 2014. Ignatious Hoh was giving a robotics demonstration to elementary school students when he was interrupted with some big news from PG&E. PG&E Bright Minds Scholarships. We awarded 10 students with a $20,000 scholarship that is renewable for up to five years, and an additional 90 students with a one-time $2,000 scholarship. 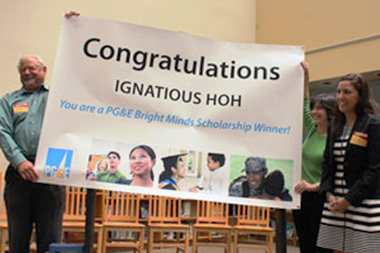 Since the program’s inception in 2012, the PG&E Bright Minds Scholarship Program has awarded $3 million in scholarships for 400 students to complete their higher education, with an increasing focus on students who major in STEM fields. Students are selected based on community leadership, personal triumph, financial need, academic achievement and commitment to pursing a STEM career. PG&E Energy Academies. More than 100 students successfully graduated from PG&E Energy Academies, with nearly 80 percent planning to attend a community college or four-year university. Starting in 2014, all 11th graders in the program also received a paid summer internship opportunity at PG&E to gain hands-on experience. 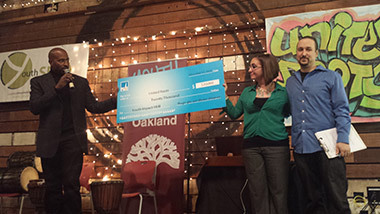 Van Jones, left, joined PG&E’s Eunice Barnett Garcia and Galen Silvestri of United Roots for the presentation of the Economic Vitality grant in Oakland. Economic Vitality Grant Program. We awarded $200,000 to 10 California organizations through this program, which provides grants to programs designed to boost local job creation and promote economic opportunity throughout our service area. Recipients included a Latina immigrant community empowerment program in San Francisco and a digital media arts training program for youth in Butte, among others. PG&E Summer Jobs for Youth. We committed over $900,000 to PG&E’s Summer Jobs program, which we offer in partnership with local Boys & Girls Club chapters in Fresno, Sacramento and Bakersfield. During 2014, the program provided about 845 young people with workforce training and helped 210 youth find paid summer jobs in their communities. To date, we’ve provided training for about 2,500 youth and helped nearly 500 youth secure summer jobs. Partners in Preparedness. We continued to partner with the Red Cross to provide Californians with critical disaster preparedness training and emergency response resources. PG&E’s $1.1 million investment enabled the Red Cross to build safer, more resilient communities through programs such as Team Firestopper and the FEMA award-winning Ready Neighborhoods. Over the past three years, PG&E’s investment has helped train, educate or engage more than 2 million people in California. 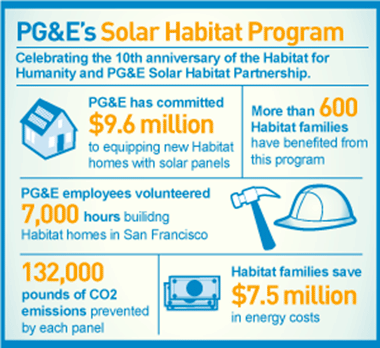 In April 2015, PG&E celebrated its 10-year partnership with Habitat for Humanity. PG&E Solar Habitat Program. Through this award-winning program, PG&E fully funds the installation of solar panels on every new Habitat for Humanity-built home in our service area. The program saves each family approximately $500 a year on energy costs, avoids the emission of 132,000 pounds of carbon dioxide to the atmosphere over the 30-year life of the system and provides popular volunteer opportunities for our employees. In 2015, PG&E marked the 10th anniversary of this partnership to bring solar energy to hardworking families with limited incomes. PG&E Nature Restoration Trust. We sponsored a project by River Partners and the Kern River Corridor Endowment to restore part of the Panorama Vista Preserve and plant more than 3,000 native trees and shrubs. The project was part of the PG&E Nature Restoration Trust, a partnership with the National Fish and Wildlife Foundation (NFWF) that supports community-based projects to restore natural habitats. In honor of Earth Day, we also partnered with the NFWF to plant more than 55,000 new trees in the wildfire-stricken Los Padres National Forest on behalf of customers who enrolled in paperless billing. PG&E employees gave back to our communities through personal donations and volunteering. In 2014, PG&E contributed more than $23 million to charitable organizations through about 1,300 grants, representing 1.3 percent of our pretax earnings from operations from the prior year. This exceeded our 1.1 percent target and the benchmark of 0.93 percent based on the median percentage of total giving from Fortune 500 companies. PG&E’s community investments are focused on providing assistance to underserved communities, such as low-income individuals, communities of color, women and girls, veterans, senior citizens, people with disabilities and members of the lesbian, gay, bisexual and transgender (LGBT) community. 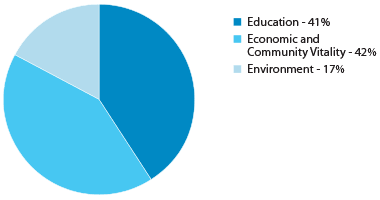 In 2014, approximately 80 percent of PG&E’s community investments were directed toward these groups, consistent with the prior year. PG&E partners with Junior Achievement of Northern California, an organization with hands-on, experiential programs that serve more than 100,000 students from kindergarten through high school with knowledge and skills in financial literacy, work readiness and entrepreneurship. 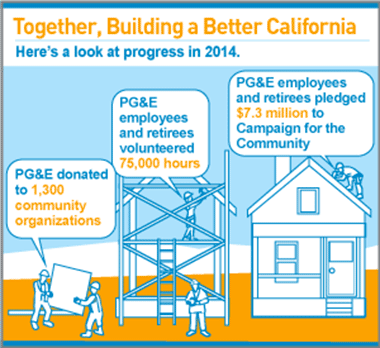 In 2015, PG&E expects to invest more than $25 million in charitable funding to support underserved communities. Our strategy includes an expanded focus on emergency preparedness to reinforce PG&E’s commitment to safety in the communities where we live and work. We are also working to strengthen the tie between our community investments and our future workforce needs by partnering to provide students with internships and job-shadowing opportunities.